Tangled and True: subway christmas art. A friend emailed me this link last week. 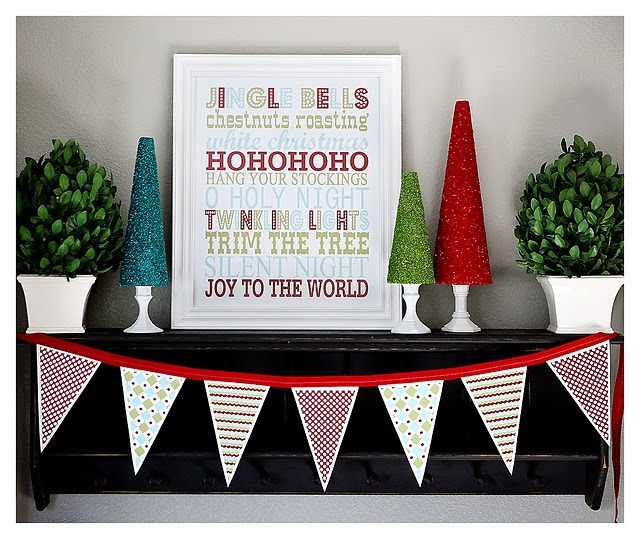 I LOVE this simple yet fun Christmas decor. Blog eighteen25 has a free downloadable version of the subway print you can send to your local Costco or photo center, then buy yourself a frame and voila you're done. The banner and glitter trees look pretty simple as well. Happy Crafting! Adorable thank you so much! Thank you! I had a Santa frame lying around that I'd been hoping to put a photo with Santa in, but my 18-month-old never let us put her close enough to get a picture. So this is great! Thanks again! I can't seem to determine if my costco does printing. IS there a link to their website to send images electronically or did you take a digitized image to your local costco with on-site print services? KJ, they should print it in their photo department. If you don't have a sign in you can put it on a disk and take it into the store and have them print it that way, if you do have a sign in you can do it all online. Let me know if you have any other questions. Thank you! I love this little sign.